If you're a fan of Blazer Brass 9mm ammo, you should pick up this quality Plano Can filled with seven boxes of 115 grain full metal jacket; a total of 350 rounds. Blazer Brass ammo is made on the bank of the Snake River in Lewiston, ID. They have gained a reputation as one of the best target ammunition lines made in the USA.
. Plano Molding are experts when it comes to developing quality, practical outdoor storage solutions. This quality ammo box is a great way to store your ammo to keep it dry and in pristine condition. Whether you intend to use this ammo this weekend or any other time this century, this box is for you! This is great ammo for the price. I shot 250 rounds from a Taurus PT111 and had zero issues. No FTF no jams just ate rite through em. Leaves some good amount of dirt on your hands from but god made dirt and dirt don't hurt me or my gun! not one jam or feed issue !!! Damn good deal - Repeat Customer here!!! Fired many a Blazer Brass 9mm ammo round with 'Zero' issues, through my Springfield's and Glock 9mm's. This ammo fires a lot cleaner than other brands and I don't hesitate when buying Blazer Brass. Seriously, the company's attention to detail even extends down to the polished bullet face. 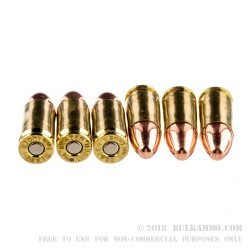 This "350 Rounds of 9mm Ammo by Blazer Brass - 115gr FMJ" being sold through BULKAMMO.com, even with Insurance/Shipping, is still a deal. 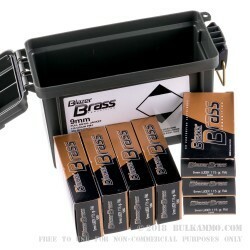 Not only do you receive a decent plastic ammo box (Plano Can), but you get a fair price and fast shipping for what would ultimately be a more expensive price (plus tax) for 7 boxes of 50 round ammo at your local ammo store. I for one, will be buying more ammo through BulkAmmo! Q: Ammo can as pictured included? A: Hello! The Plano can that is pictured is included with the ammunition. It will be packaged with 7 boxes of 9mm along with some cardboard spacers in the can to ensure everything fits in a way to restricts the movement of ammo in the can. Q: Does it come with ammo box ? A: Hello Jeromey! 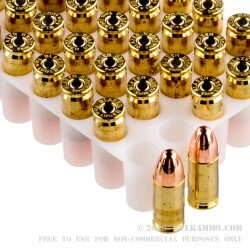 This CCI Blazer Brass ammunition does come in the pictured Plano ammo box for storage purposes! It comes packaged with 7 - 50 round boxes per 350 round can. 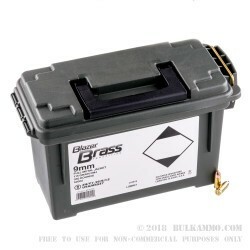 Q: pictured on this add for 350 Rounds of 9mm Ammo by Blazer Brass - 115gr FMJ you show an ammo box, will it come in the ammo box? A: Hello Ron, The 350 rounds of Blazer Brass 9mm ammunition does come packaged in the ammo can.